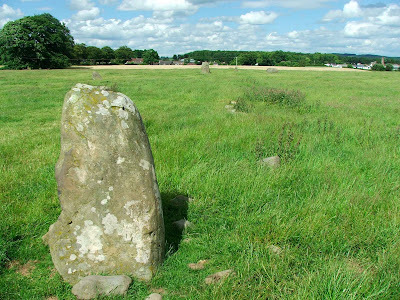 This stone circle was visited in June 2008, along with many towers and castles in the area. 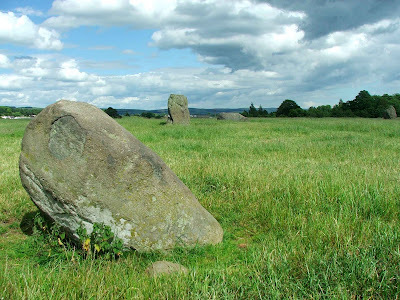 If you're not aware that this circle here, it is all too easy to pass on by, as it is hidden away in a field off the main road, and although it's the largest stone circle in Scotland, and the fifth largest in the UK, it is fairly indistinguishable from the landscape in which it can be found. 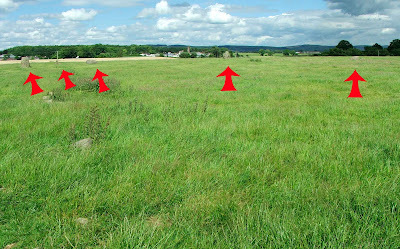 The above photo gives some indication of how flat the area is, and how the fallen stones blend into their surroundings. 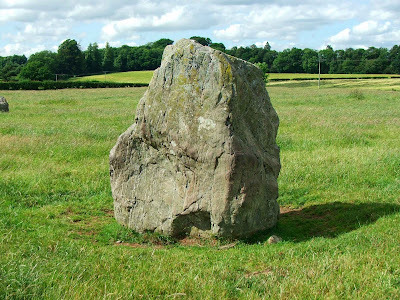 There are eleven stones remaining out of a possible original nineteen, with all but five of the stones now fallen. Of these five standing stones, the tallest is around 1.9metres tall, with the largest measuring around 3.5 by 2.5 metres. The diameter of the circle stands at around 88 metres. 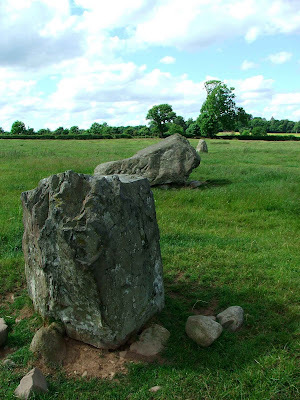 It is estimated that the circle dates from around 2000BC and is one of many prehistoric earthwork features in the area. 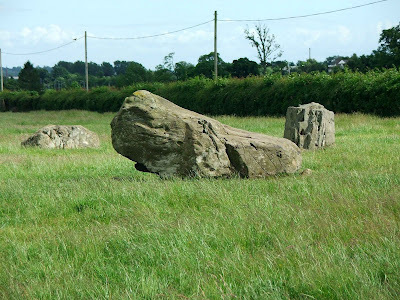 Only four of the stones are of local origin, with the rest from quarries some miles away. 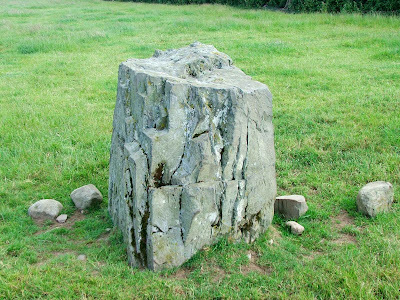 The circle used to be split in half by a field boundary, but this was removed in the 1880's completing the circle again, and allowing full access. Although there is no public right of way through the field in which the circle sits, it appears that the land owner, fearful perhaps that his walls would be damaged, has kindly built a stile over the wall. Some of the stones have marks on that bear a passing resemblance to 'cup and stone' marks....early stone decoration. Most documentation on this site however, advises that these marks are probably the result of weather erosion. This site is definitely worth a visit, although lower your expectations so that you won't be disappointed. I went to see this circle twenty years ago and despite driving around in circles for some time did find it eventually! It was divided by a hedge with crops growing around and inside the circle but despite that had a fantastic spiralling energy to it. Planning to visit again next year. In some ways it's great that such a powerhouse is still generating but sad that such a place of antiquity is not marked.